Preferred Habitat: Fields and open country. Seasonal Occurrence: Abundant throughout the year. Permanent resident. Profile by Vicki Stittleburg: With a gray back and crown, white throat and long tail, the Loggerhead Shrike can somewhat resemble a Northern Mockingbird, but the black mask, black wing plumage and blocky head with a heavy bill are distinguishing features. 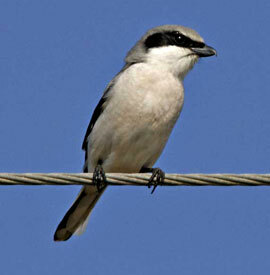 The Loggerhead Shrike is a member of the songbird family, but it behaves more like a raptor. Often spotted perching atop trees, utility poles, fence posts, or wires, this predatory bird watches for prey such as insects, birds, lizards and small mammals. Lacking the talons and strong feet of hawks and owls, the shrike must impale its prey on thorns or barbed wire. This behavior earned the shrike the nickname "butcher bird". The scientific genus name for shrike, Lanius, means butcher. Open country with scattered shrubs and trees is the typical habitat of the Loggerhead Shrike. Look for this predatory songbird in pastures, fields, and suburban parks. Though Loggerhead Shrikes are fairly numerous across Texas, their populations have fallen sharply during recent decades. Loggerhead Shrikes have been listed as endangered, threatened, or of special concern in several states and Canada. Reasons for the decline are poorly understood, but may be related to pesticides and habitat alteration. Given this bird’s potentially high reproductive rate, and provided that adequate habitat continues to be available, Loggerhead Shrike populations may be able to recover if the causes of the bird’s decline can be identified and eliminated.